Some yields, when part of a diversified portfolio, might be thought of as certain cash flows. The more certain your cash flows, the greater probability of success your retirement plan will have. Sure-thing dividends might mean you’re closer to being able to retire than you think. Colorado Wealth Management’s (CWM’s) recent SA article “How To Retire Without Sucker Yields” got us thinking. The temptation is always there. Surely it wouldn’t hurt to buy a few abnormally high-yielding stocks, right? Just a few of these in the portfolio could really juice the portfolio’s income stream, you say to yourself. But there’s usually a voice in your head reminding you that, if something looks too good to be true, it probably is. CWM points out a few examples of stocks where the dividend or distribution is almost surely not what it seems, or at least not sustainably so--we’re talking double-digit-yielding REITs and the like. As CWM says, if you don’t have the time or skills to really do your homework on a stock with an abnormally high yield, it’s going to be best to give it a miss. CWM states in the article that, while total returns on a portfolio are the most important factor over the long haul, a dividend-oriented approach takes more of the decision making out of investors’ hands (because investors don’t need to decide when to sell as often), thus making it a lower-risk strategy. We agree. When evaluating the potential success of a retirement plan, we might even take it a step further. 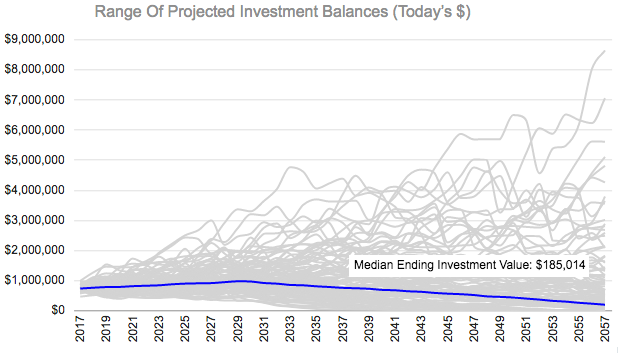 What if the component of total return in question--that is, the dividend or distribution yield--is accounted for as a sure thing when putting together a retirement plan? What we mean here is thinking about dividend income as if it were the coupon from a bond or some other certain cash flow. If your portfolio is blue-chip enough and diversified enough, it’s not a stretch to think of it this way--and the effect on the probability of a plan’s success can be dramatic. Let’s look at a hypothetical diversified portfolio of solid, income-generating stocks with above-average yields that could broadly be described as value stocks. All of these companies except GlaxoSmithKline have increased their dividends every year for 13 or more years straight. Some have gone much longer than that, topping out at 50 straight annual increases for Target. Put it all together, equally weighted, and you’ve got a portfolio of value stocks that yields a solid 4.2%--and with payouts that can reasonably be counted on to go up every year, at least modestly. It’s still surprisingly easy (given the market’s rally) to put together a well-diversified portfolio of blue-chip names that can give you an average yield of 4% or more. We might normally estimate that value stocks on the whole (not just the ones listed above) will return around 8% over the long haul, and that a quarter of that return--so two of those eight percentage points--is due to dividends. Some might argue with that 8% total return number. Others might quibble with attributing only 25% of total returns to dividends. In fact, it could be 50% or more, depending on the stocks and the time frame. * In our table above, dividends indeed make up a little more than half of our projected total returns. The larger point, though, is that, by extracting the dividend out of our total return estimate and calling it a cash flow, we change the nature of the retirement plan. We are fans of running a Monte Carlo simulation on a plan to test the probability of its succeeding. Monte Carlo has its pros and cons, but at the very least it can be thought of as a tool in an investor’s tool box. To demonstrate what we’re talking about, we’ll consider a hypothetical couple in their early 50s hoping to retire in about 14 years. For simplicity’s sake, we’ll say that their entire $700,000 portfolio is in value stocks. But what happens if we extract the dividend portion out of that total return and call it income--something we’re nearly certain will be there for us, year in and year out? What we’re mainly seeing in this before/after comparison is a narrowing of the range of likely returns. 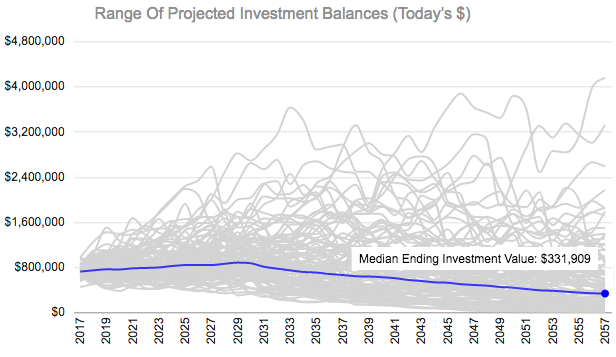 In the first case, there is a chance of hitting the jackpot (see that grey line in the first graph that ends at around $8.5 million in 2057?). But there are also a lot more simulations where the couple runs out of money--a nightmare scenario for retirees, to be avoided at all costs. Cash flows that you’re sure about make for less volatility in total returns over time. The closer you are to retirement, the less volatility you want in your life as an investor. So taking volatility out of your projections when it need not be there is just the logical thing to do. How smart is it to make this assumption? We would argue that it depends on the strength of the portfolio. Yes, Kinder Morgan (NYSE:KMI) happens. Deepwater Horizon happens. The tried and true do stumble or even fail. The Dividend Champions list and the like are very helpful, but past performance is no guarantee of future results, like the fine print says. But they’re good enough if you structure your portfolio carefully. High-quality names and diversification should protect you. If the unexpected happens, it should be company specific. If Amazon (NASDAQ:AMZN) takes a bigger bite out of Target’s lunch and Target has to cut its dividend after all these years of raising it, your diversification will allow you to absorb the hit and move on. What about fixed income? What about preferred stocks? What about this investment or that investment? We’re big fans of dividend payers, but that doesn’t mean there’s no room for other kinds of investments in a retirement portfolio. All we are trying to say here is that lumping in virtual-sure-thing returns (like solid dividend payments) with those of a more nebulous nature (the ups and downs of the stock market), while certainly a conservative approach, may actually be too conservative. Getting all of it entered into an accurate Monte Carlo simulation is one thing you can do to test it out. *For further reading, check out “ Why Dividends Matter (pdf),” a paper by a couple of mutual fund managers at Guinness Atkinson. Disclosure: I am/we are long XOM,T. I wrote this article myself, and it expresses my own opinions. I am not receiving compensation for it (other than from Seeking Alpha). I have no business relationship with any company whose stock is mentioned in this article.